First, that is what my sister Gilly sends to me and Rozzy every Easter. She found that on a card a billion years ago, and it has become a tradition. I have shared it with you. Happy whatever you celebrate, whether it's go to church, do laundry, rake the garden or have a nap. Happy happy. I still have this thundering damned headache, which by my (admittedly addled) count makes it 6 days. It's the nights, actually, that kill me. Thump, thump, thump, pillow over head, other pillow over head, get up to head to kitchen to switch out ice packs, get up to remember I also had to pee and go down to the basement to do that, get back into bed and rearrange cats who have moved to the warm spot, and try all over again. I used to get migraines all the time. Relentlessly, since I was 9, triggered by hormones, weather, barometric pressure, dehydration, sleeping too much, not sleeping enough, and wearing unmatched socks. I may have made that last one up, but it feels like it sometimes. They've let up a lot over the past few years, which is nice. I remember at about age 10 sitting in the doctor's office, as my mother and the doctor spoke over my head. "I hate all these drugs you're recommending," said my mother, from whom I got the headaches. "Well, Iris, (that was my mom), the only way they're going to let up is when she hits menopause, as you know." I recall looking at him and asking what menopause was. I am obviously creeping up on menopause, and I've been grateful for the relief from so many headaches. I could do without the hair sprouting in odd places, but I'll deal with it. The problem is when I get a headache now, it thunders in from the wings and shocks me. The constant, chronic pain I was so used to is sort of like labour: when it's over, you forget it. And at least with a headache, you're not stuck with a newborn at the end. I knew I had to make dinner, and I didn't shop the past few days. The stores are keeping silly hours based on a holiday that somehow lasts for four days, except it takes Saturday off so the malls can open. I had a roast in the freezer I figured I could do something with. I hauled it out yesterday, a thunk of meat that had been in there nobody knows how long. I shrugged. They're boys, I reasoned. As if they'll notice. I hacked it up to make a stew. There is a great deal of meat in this stew. I went to get a can of cream of something soup, and reaching to the far reaches of the lazy susan, finally found a can. I blew on the dust on the lid. Nothing happened. I rinsed it under the tap. Nothing happened. I finally scrubbed the crud off with a cloth. Ah. Best before January 2010. I paused, thinking "well, that's only a year and a bit," before realizing this was 2012 (told you it's been a bad headache) and deciding even I wouldn't risk that. I made Christopher get up and go to the drug store. I called Roz and as we spoke, I told her of the date on the soup. She paused as well. We really are our father's daughters. She told me there was a really easy way to fix the missing soup dilemma. I told her I'd already called my neighbour, who wasn't home. Roz sighed. 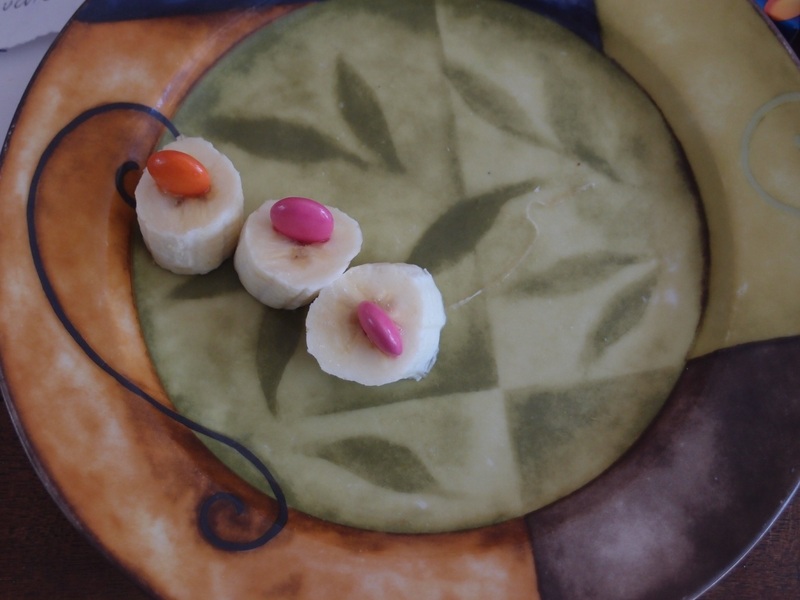 I just cut up a banana into slices, and stuck a Smartie in each one. I told the boys they were Easter hors d'oeurves. Ari looked at me and asked who made them. Christopher said it must have been the not-home-non-soup-supplying neighbour. And here I am, spoiling the little ingrates with stew made from suspect beef, and very nearly made from rusty soup. You have the coolest dishes EVER!! I agree about not liking having to put an inordinate amount of planning into the Easter weekend feeding frenzy. This not being able to go to the store nonsense is... well... nonsensicle. Like a popsicle but with nonsense. Nice hors d'oeurves. Look sorta like sushi. I've had one for a couple of days (barometric pressure is MY trigger) and it just won't go away. Had to go to the car yesterday to get someting and it was so bright out I amost passed out. Quickly went back to the dark environs that makes up my living room.